Define heat as transfer of energy. In Chapter 7 Work, Energy, and Energy Resources, we defined work as force times distance and learned that work done on an object changes its kinetic energy. We also saw in Chapter 13 Temperature, Kinetic Theory, and the Gas Laws that temperature is proportional to the (average) kinetic energy of atoms and molecules. We say that a thermal system has a certain internal energy: its internal energy is higher if the temperature is higher. If two objects at different temperatures are brought in contact with each other, energy is transferred from the hotter to the colder object until equilibrium is reached and the bodies reach thermal equilibrium (i.e., they are at the same temperature). No work is done by either object, because no force acts through a distance. The transfer of energy is caused by the temperature difference, and ceases once the temperatures are equal. These observations lead to the following definition of heat: Heat is the spontaneous transfer of energy due to a temperature difference. As noted in Chapter 13 Temperature, Kinetic Theory, and the Gas Laws, heat is often confused with temperature. For example, we may say the heat was unbearable, when we actually mean that the temperature was high. Heat is a form of energy, whereas temperature is not. The misconception arises because we are sensitive to the flow of heat, rather than the temperature. Owing to the fact that heat is a form of energy, it has the SI unit of joule (J). The calorie (cal) is a common unit of energy, defined as the energy needed to change the temperature of 1.00 g of water by —specifically, between and since there is a slight temperature dependence. Perhaps the most common unit of heat is the kilocalorie (kcal), which is the energy needed to change the temperature of 1.00 kg of water by Since mass is most often specified in kilograms, kilocalorie is commonly used. Food calories (given the notation Cal, and sometimes called “big calorie”) are actually kilocalories ( ), a fact not easily determined from package labeling. Figure 1. In figure (a) the soft drink and the ice have different temperatures, T1 and T2, and are not in thermal equilibrium. 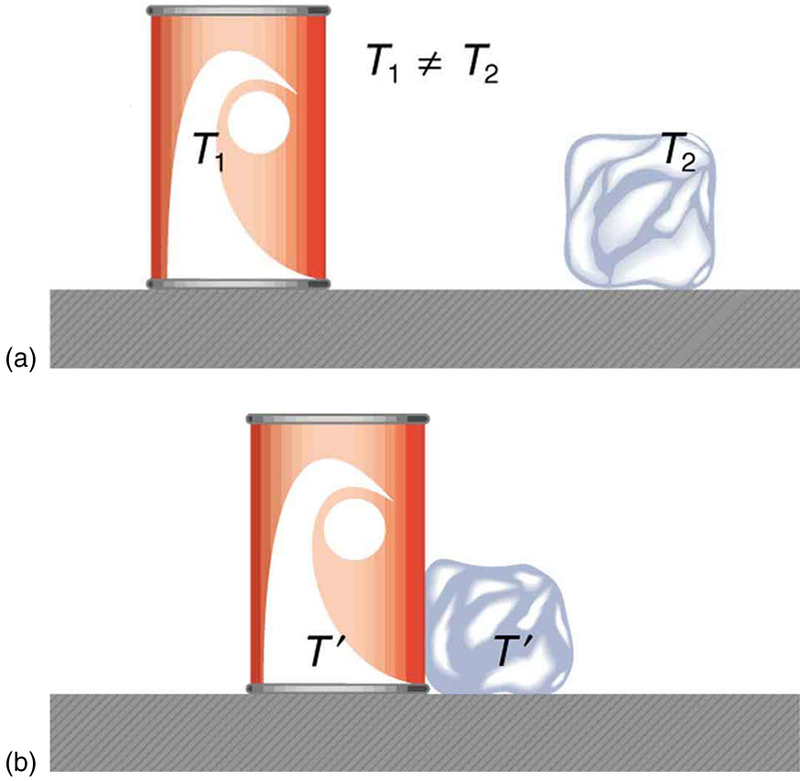 In figure (b), when the soft drink and ice are allowed to interact, energy is transferred until they reach the same temperature T′, achieving equilibrium. Heat transfer occurs due to the difference in temperatures. In fact, since the soft drink and ice are both in contact with the surrounding air and bench, the equilibrium temperature will be the same for both. Figure 2. 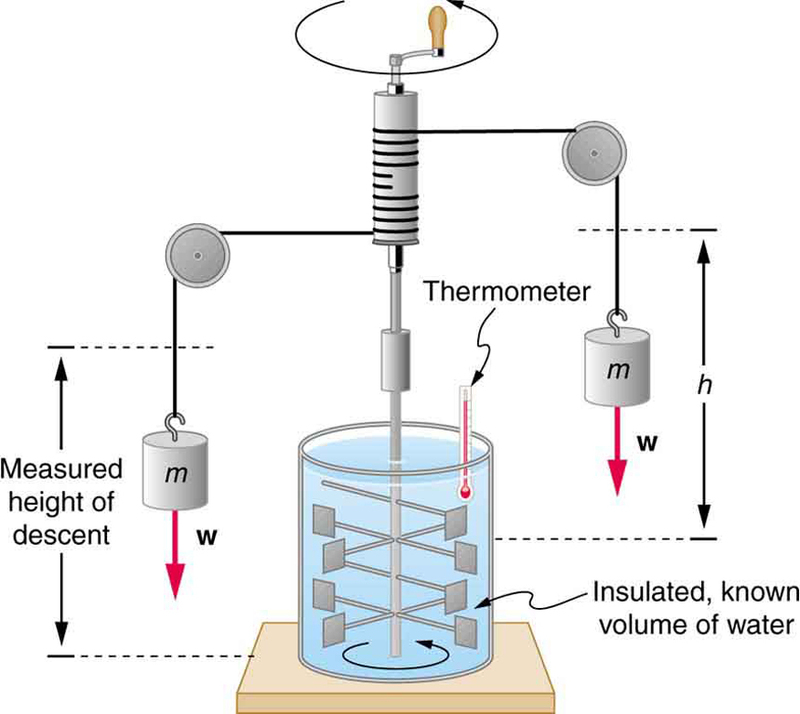 Schematic depiction of Joule’s experiment that established the equivalence of heat and work. 1: Two samples (A and B) of the same substance are kept in a lab. Someone adds 10 kilojoules (kJ) of heat to one sample, while 10 kJ of work is done on the other sample. How can you tell to which sample the heat was added? 1: How is heat transfer related to temperature? 2: Describe a situation in which heat transfer occurs. What are the resulting forms of energy? 3: When heat transfers into a system, is the energy stored as heat? Explain briefly. 1: Heat and work both change the internal energy of the substance. However, the properties of the sample only depend on the internal energy so that it is impossible to tell whether heat was added to sample A or B. 14.1 Heat by OpenStax is licensed under a Creative Commons Attribution 4.0 International License, except where otherwise noted.